"Express passenger train" redirects here. For the train in New South Wales, see New South Wales XPT. The distance of an inter-city rail journey is usually at least 50–100 km (31–62 mi), although in many large metropolitan areas commuter and regional services cover equal or longer distances. A distance of 100–500 km (62–311 mi) is a common journey distance for inter-city rail in many countries. In many cases, railway travel is most competitive at about 2–3 hours journey time. Inter-city rail can often compete with highways and short-haul air travel for journeys of this distance. In journeys of 500–1,000 km (311–621 mi), the role of inter-city rail is often replaced by faster air travel. Development of high-speed rail in some countries increases the share of railway for such longer-distance journeys. The Paris-Marseille TGV (750 km or 466 mi, or 3 hours) and Tokyo-Aomori Shinkansen (675 km or 419 mi, or 2 hours 59 minutes) are examples of this type of journey. In conventional non high-speed rail, overnight trains are common for this distance. Faster high-speed rail of 350 km (217 mi), such as the Beijing–Shanghai High-Speed Railway in China (1,300 km or 808 mi, or 5 hours) and Tokyo-Sapporo in the proposed Hokkaido Shinkansen in Japan (1,000 km or 621 mi, or 4 hours), may play a significant role in long-distance travel in the future. Trains run by China Railways link almost every town and city in the People's Republic of China mainland, including Beijing, Guangzhou, Shanghai, Shenzhen and Xi'an, as well as onwards from Shenzhen across the border to Kowloon, Hong Kong. New high-speed lines from 200–350 km/h (124–217 mph) operation are constructed, and many conventional lines are also upgraded to 200 km/h (124 mph) operation. Currently there are seven High-Speed Inter-City lines in China, with up to 21 planned. They are operated independently from the often parallel High-Speed-Rail-Lines. DMU tilting train express "Super Ōzora" in Japan. Almost every major town and city in South Korea is linked by railway, run by Korail. 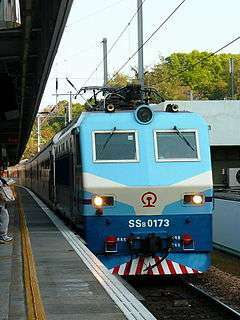 Mugunghwa-ho is the most common and most popular type of intercity rail travel. In addition, Seoul and Busan are linked by a high-speed train line known as KTX, which was built using French TGV technology. There is only one train service in Cambodia, from Battambang to Phnom Penh, running once a week. The Philippines had relaunched their inter-city rail service. It runs between Manila and Bicol Region. The Philippine National Railways had their Bicol Express and Mayon Limited as their inter-city rail service brands. The Bicol Express leaves Manila and passes through cities of Manila, Pasay, Muntinlupa. The train also passes the provinces of Laguna, Quezon, and Camarines Sur before arrives at Naga City. The train leaves Manila at 06:30pm PST (UTC+8) and arrives at NAGA at 04:30am PST (UTC+8). The return trip leaves NAGA at 06:30pm PST (UTC+8) and arrives at MANILA at 04:30am PST (UTC+8). The trip clocks 10 hours or 600 minutes. The trip is designated 611 for southbound and 612 for northbound. Also, The Mayon Limited leaves Manila at 08:30pm PST (UTC+8) and arrives at Ligao at 07:00am PST (UTC+8). The return trip leaves Ligao at 07:15pm PST (UTC+8) and arrives at Manila at 05:30am PST (UTC+8). The southbound train operates as trip number 713 (de luxe) or 815 (ordinary) and the northbound train operates as trip number 714 (de luxe) or 816 (ordinary). The trip clocks 10 and a half hours, ordinary and deluxe. Taiwan Island's coastline is connected by frequent inter-city train services by Taiwan Railway Administration. Taiwan High Speed Rail, opened in 2007, covers the most populated west-coast corridor. Israel Railways operates inter-city services between all the 4 major metropolitan areas of Israel; Tel Aviv, Jerusalem, Be'er Sheva and Haifa. 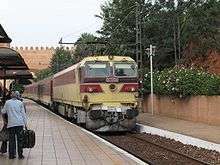 However, due to the small geography of Israel, most of the railway services have a more suburban service pattern, with many short stops at stations between the major city centres. In Europe, many long-distance inter-city trains are operated under the InterCity (Intercity, or often simply IC) brand. InterCity (or, initially, "Inter-City" with a hyphen) was first conceived as a brand name by British Rail for the launch in 1966 of its electrification of the major part of the West Coast Main Line, notably new express services between London and the major cities of Manchester, Birmingham and Liverpool. It later became the name of one of British Rail's new business sectors in the 1980s and was used to describe the whole network of main-line passenger routes in Great Britain, but it went out of official use following privatisation. InterCity had become an iconic brand in the 1970s mostly because of the introduction of the British Rail Class 43 (HST). The principal network of international express trains in continental Europe is called EuroCity, to distinguish it from the national InterCity networks and to indicate its better support for international journeys even though some IC trains also cross borders. High-speed railways have relatively few stops. The German high-speed train service was named InterCityExpress indicating its evolution from older InterCity trains. Other high-speed lines include the TGV (France), AVE (Spain), Treno Alta Velocità (Italy), Eurostar (United Kingdom–France and Belgium), Thalys (Netherlands–Belgium–Germany and France) and Railjet (Austria-Hungary). 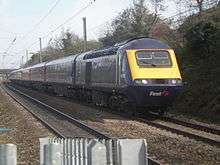 In Great Britain, the inter-city rail links are now operated by a number of private companies as well as Continental State owned railways such as Virgin Trains, Virgin Trains East Coast, East Midlands Trains, CrossCountry, and First Great Western. Ireland's inter-city rail network is maintained by Iarnród Éireann and Northern Ireland's is run by Northern Ireland Railways. Polskie Koleje Państwowe, a state-owned corporate group, is the main provider of railway services. The PKP group holds an almost unrivaled monopoly over rail services in Poland as it is both supported and partly funded by the national government. As of 2008, foreign services operate on the Polish Railways network. These include EuroCity and EuroNight trains operating between Western and Eastern European destinations, most notably the EN Jan Kiepura direct sleeping cars which operate between Russia and Amsterdam, Basel and Munich via Warsaw, Poznań and Germany. These trains generally consist of varied coaches from different rail operators that are added to the train as it passes through their area of operation. Russia has dense network of long-distance railways all over its vast territory, the longest and most famous being the Trans-Siberian Railway from Moscow to Vladivostok. Long distance train of more than 1,000 or 2,000 km (621 or 1,243 mi) is common and they keep on running two or three days. Speed is relatively low with 60 or 70 km/h (37 or 43 mph) average. 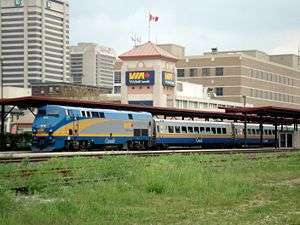 Canadian inter-city trains are mostly run by Via Rail, and connect many but not all major cities. Ontario Northland Railway operates passenger service in Northern Ontario. International trains, run jointly by Amtrak and Via Rail, connect New York with Toronto and Montreal. Amtrak operates the Amtrak Cascades service linking Vancouver and Seattle. The White Pass and Yukon Route links Alaska with the Yukon. Tourist oriented inter-city service includes the Royal Canadian Pacific, Rocky Mountaineer, and Whistler Mountaineer. 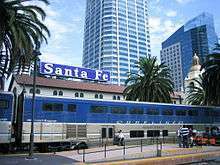 The Mexican federal government discontinued almost all scheduled inter-city passenger trains in January 2000. Ferromex operates trains on three routes: Chihuahua to Los Mochis, Torreon to Felipe Pescador, and Guadalajara to Amatitan. The President Enrique Peña Nieto has proposed intercity trains, the proposed projects are Mexico City-Toluca (construction began July 7, 2014), the Peninsular train (Yucatán-Mayan Riviera), Mexico-Querétaro high speed train (with future expansion to Guadalajara) and Puebla-Tlaxcala-Mexico City. There was a dense system of inter-city railways in the United States in the late 19th and early 20th centuries, but after the decline of passenger railroad in North America in the 1960s, the inter-city lines decreased greatly. Today the system is far less dense and is operated by the government-owned Amtrak company, with the exception of Alaska, which uses the Alaska Railroad (which is also government-owned). The most heavily used routes with the greatest rider-ship and schedule frequencies are in the Northeastern United States, on Amtrak's Northeast Corridor. About one in every three users of mass transit in the United States and two-thirds of the nation's rail riders live in New York City. The two busiest passenger rail stations in the United States are Penn Station and Grand Central Terminal, both in New York City. Passenger rail outside the Northeast, Northwest, California and Chicago is infrequent and rarely used relative to networks in Europe and Japan. Multiple new rail corridors have been identified for private development throughout the country. These include the Eastern Flyer route in Oklahoma, the All Aboard Florida route between Miami and Orlando, and a high-speed line in Texas. EMU QR Tilt Train in Queensland. In Australia the national interstate network operated by Great Southern Rail connects all mainland Australian capital cities except Canberra and Brisbane. Intrastate inter-city trains that traverse shorter distances are operated by V/Line, NSW TrainLink, Queensland Rail and Transwa. Many of Australia's inter-city trains are not true inter-city services, given their leisurely average speed and primary role to transport people between regional areas and the nearest capital city or for the tourist market. As a result, Australian networks refer to these services as "country" trains. The fastest intercity trains in regular service are the tilting trains used by Queensland Rail, which have a top speed of 160 km/h and an average of 80 km/h. In Brisbane, QR's City network operates a smaller interurban commuter network of three lines which connect Brisbane to the Gold Coast in the south, the Sunshine Coast in the north and Rosewood in the west. On these systems, services either run as limited-stop expresses in the suburban area (e.g. Blue Mountains services) or as shuttles terminating where the suburban lines end (e,g. Rosewood services). Other current non-commuter passenger services are long-distance commuter or scenic services: the Capital Connection , Seasider, and the Wairarapa Connection. A network of regional and long-distance rail passenger services up till the mid-twentieth century has largely been replaced by air or bus services. A few countries of South America were once interconnected by international train services, today they are almost non-existent. Most of governments in the continent have favoured roads and automobile transportation since mid-20th century. Chile has inter-city services connecting Santiago to Chillan, run by Empresa de los Ferrocarriles del Estado. ↑ "Bicol Express - Philippine National Railways". Pnr.gov.ph. Retrieved 2012-10-04. ↑ "Mayon Limited - Philippine National Railways". Pnr.gov.ph. Retrieved 2012-10-04.